For soon 70 years, BS coatings has been offering its clients, as partners for growth, innovative solutions in response to their needs for today, tomorrow and the future. With inovation and service, Quality management is one of historical basics of BS coatings. 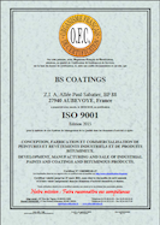 Certified ISO 9001 since 1996, BS coatings keeps improving and investing continuously to guarantee optimal quality of products and services for the high satisfaction of customers. Fully aware of challenges linked to our activity, we optimize the approach and development of our products in order to limit their impact on the planet and humans. BS coatings has commit oneself for many years in responsible and ethical concept towards environment, human ressources or third parties. This commitment has been validated by GOLD rating when evaluated by ECOVADIS. Our constant investment in human and material resources keeps BS coatings at the forefront of innovation and creativity. Our objective: the high performance and optimisation of coatings. Our qualified support teams will assist you all over the world to guarantee the best application and performance of our products with the single intention : QUALITY.